Guyana is a small English-speaking country in South America, quite popular as a tourist destination. Although Guyana has one of the lowest GDP in its region, its growth has been steady over the past few years. This has had a positive impact on the telecommunications market, including the mobile communications sector. Let us see whether we can successfully earn money on terminating traffic in Guyana. To date, the country's population is about 783 thousand people and mobile penetration has reached 90% (about 696 thousand connections). International traffic in the country is generated mainly at the expense of tourists. There are two operators in the cellular market - Digicel and GTT +, their services are used by approximately equal number of subscribers in Guyana. SIM-cards in the country are expensive - about $9 apiece and they do not provide welcome bonuses. The standard rates for local calls are also high - about $0.12 per minute. With an average rate of $0.07- $0.12, it's very expensive. However, local GSM operators have more advantageous offers, using which you can reduce the cost of a minute of the call. 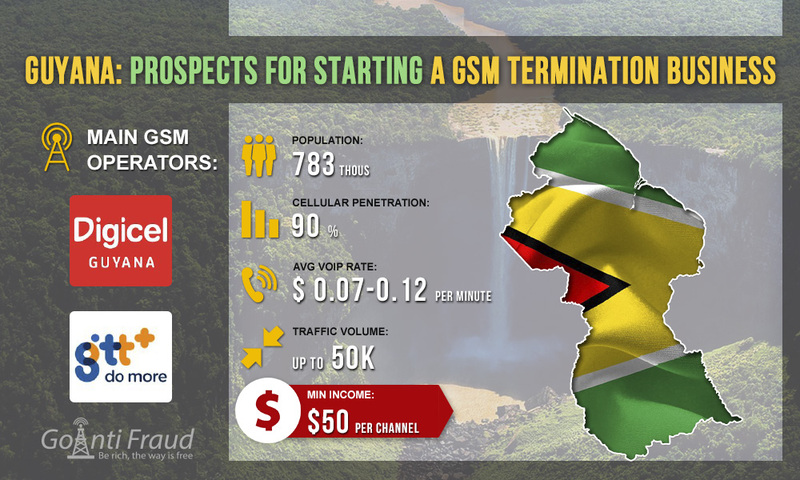 Earnings of the terminator in Guyana will be approximately $50 from the voip gsm gateway bangladesh channel (with the equipment running for 600 minutes per day). To earn more, use the maximum number of channels, but place the gateways in different locations. It is important to agree in advance upon providing of sufficient amounts of traffic with the originator - this will help avoiding downtime of the capacity.